The food in Cambodia is great. There is a lot of coconut and fresh fruit. There are hints of the curry one expects due to proximity to Thailand. Noodles are loved, but so are French baguettes, a reminder of colonial times. The food is not as hot as in Thailand, but it is still wonderfully flavorful. My first day in Cambodia, I had lunch at Jasmine, a restaurant with a roof but no walls, with palm trees and flowers crowding the building. Among the half a dozen dishes they brought us was fish amok, which was served in a hollowed out coconut shell. A warm breeze mixed the fragrance of flowers with the aromas of the foods on the table, which made for a memorable meal. Fish amok is among Cambodia’s most popular dishes. I have had several versions, some more like a quiche, but the first way I had it, at the Jasmine Restaurant, has always seemed like the “right” version. If you can’t get to Cambodia, at least you can now get a hint of its taste. Enjoy. Cut fish fillets into roughly 1/2-inch squares. Place fish in 1 quart, oven-proof bowl. Whisk together all other ingredients, except lime leaves. Pour over fish and stir, to make sure every piece of fish is coated. Place bowl in the top compartment of a steamer. Steam for 15 minutes, stir, then return to the steamer for another 5 minutes, or until fish is cook and amok is heated through. This recipe is Spanish, and it is most commonly served as a tapa, or appetizer. The term tapa means “cover,” and it refers to the practice of covering your drink with a card to keep the flies out. People would then use the card on top of their drinks as a place to set down nuts, olives, or whatever other finger food might go well with what they were drinking, and soon, the nibbles became know as tapas, too. Dates were introduced into Spain by the Moors, as were almonds. This recipe is easy and delicious. Enjoy. Preheat oven to 425 degrees F. Stuff one almond into each date. Wrap the date with bacon and put it on a jelly roll pan or other baking sheet with sides, seam side down. Press down a little, to flatten a tiny bit, to keep it from unrolling. Alternatively, you could fasten the bacon with a toothpick that has been soaked for an hour in water (to keep it from bursting into flames in the oven). Bake for 8 minutes, then turn the bacon-wrapped dates over and return to the oven. Continue to bake until bacon is crisp (check after 5 minutes, but can take up to 8 minutes on side two, depending on your oven). You may want to blot the cooked dates on a paper towel, to soak up a bit of grease, as you transfer them to a serving dish. Serves 4. Notes: As an experiment, I tried stuffing the dates with sliced garlic—slice a clove of garlic into 1/8-inch slices—instead of the almond, or along with it. Yum. Not traditional, but I don’t think anyone in garlic-happy Spain would complain. 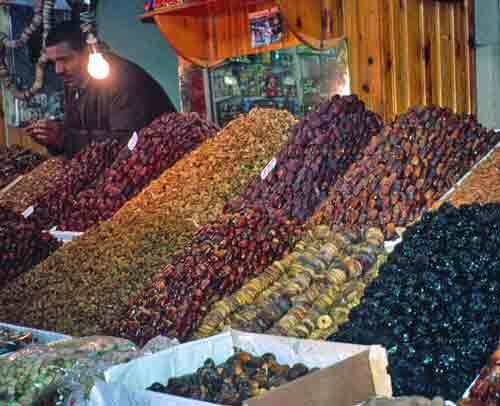 Dates are a staple food in many desert lands, and this dried fruit seller in Meknes, Morocco, offers many different varieties, along with a few figs. While a coconut palm may be the quintessential image of hot, humid, tropical landscapes, the inescapable image in hot, dry, desert landscapes is the date palm. (Have you ever seen a picture of a desert oasis that didn’t include a date palm?) In arid parts of the Old World, the fruit of the date palm is sufficiently important to actually be categorized as a staple. Desert Arabs often have little else to eat besides milk and dried dates. Tree of Life—it sounds somewhat mythical or mystical, but in many parts of the world, not only does such a tree exist, it exists in abundance. 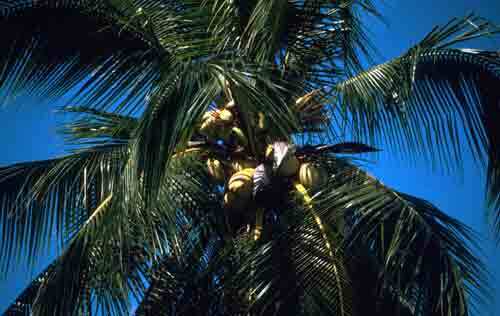 It is the coconut palm, that slender, graceful tree that is so much a part of our image of tropical paradise. While coconut is enjoyed worldwide, for approximately one-third of the planet’s population, coconut is a major food group. It is an essential part of the diet in West Africa, and coconuts and coconut milk are dominant ingredients in the cuisines of southern India, Southeast Asia, Malaysia, and the South Pacific. In many of these places, coconut milk holds a position similar to, and even more important than, that of cow’s milk in Western cultures. While most of us in the West think of coconut as a confection, it is important enough in the Eastern hemisphere to be considered a world staple and one of the planet’s most important food crops. 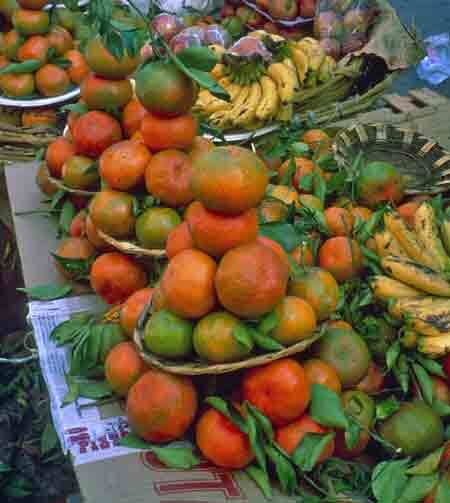 Oranges in an outdoor market in Mexico. The room that surprised me most at London’s Hampton Court Palace, the first time I visited, was the orangery. I expected a lot of things in a palace, but not agriculture. The orangery at Hampton Court is a wonderful, bright room with high ceilings and high, arched windows that can be opened out onto a patio. The room was lined with rows of small, healthy, carefully trimmed orange trees in beautiful, large, porcelain pots. A few years later, I visited Mount Vernon, George Washington’s home in Virginia. I had seen pictures, so I knew what the main buildings would look like, but I was surprised to find, tucked behind some of the fabulous gardens, a magnificent orangery. This was beginning to look like a trend.